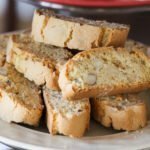 Home » Classic Biscotti are Delicious and Versatile! 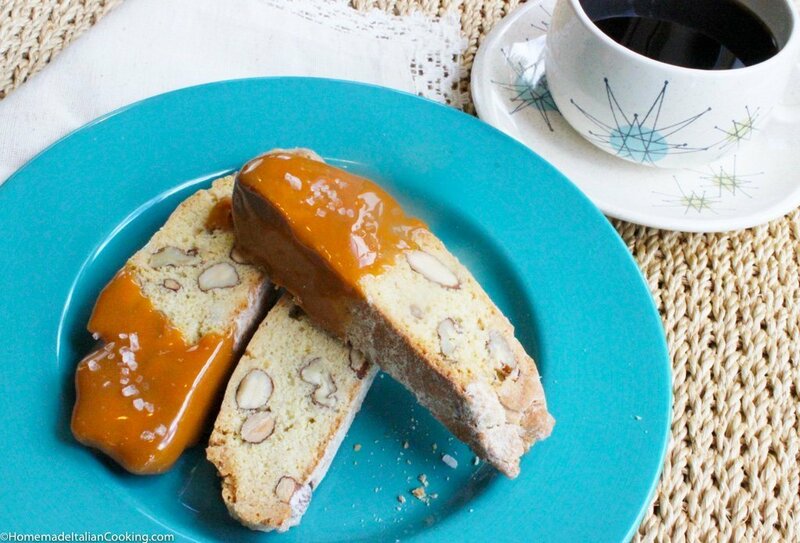 Homemade Classic Italian Biscotti are nothing like the ones bought in the store. They are much better! Fresh, homemade Biscotti are buttery, crumbly, and loaded with flavor. They are also very easy and forgiving to make. This recipe works because it uses butter and my secret ingredient – a touch of cornmeal for a delightful crunch. The recipe calls for a twice-baked process. The first time it is baked in a loaf shape. Then slice the loaf and bake the slices again until slightly crunchy and golden. They will keep for weeks in an airtight container. For extra goodness, dip one end of the baked Biscotti in a sweet topping such as rich caramel and dusted with coarse salt. So yummy! I love Biscotti for breakfast. They are not too sweet and very satisfying. Just perfect with a cup of coffee. You can get creative and mix up the flavors for a variety of wonderful Biscotti for every occasion. What is your favorite combination of flavors? You can watch my video on the entire process for making Biscotti to see how easy they are! 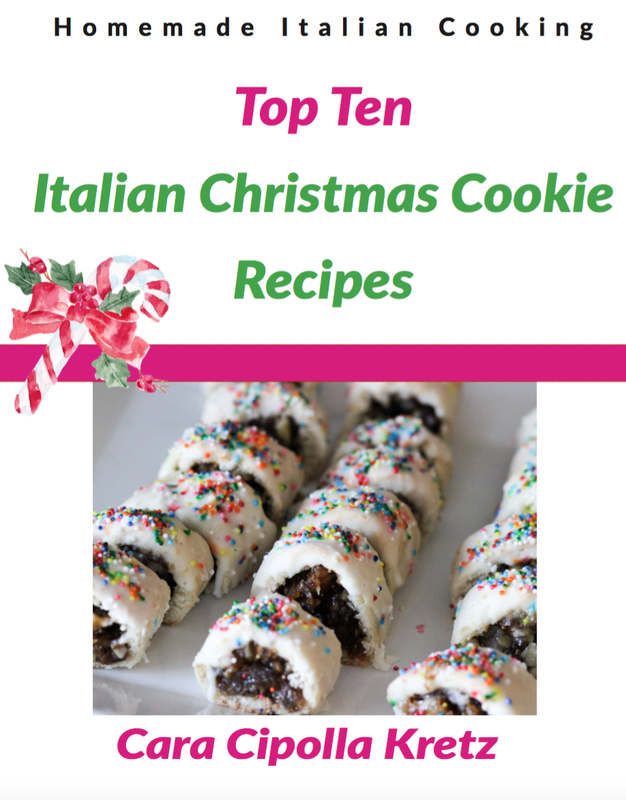 If you like these cookies, download my FREE eBook “Top Ten Italian Christmas Cookies” and start baking for the holidays! 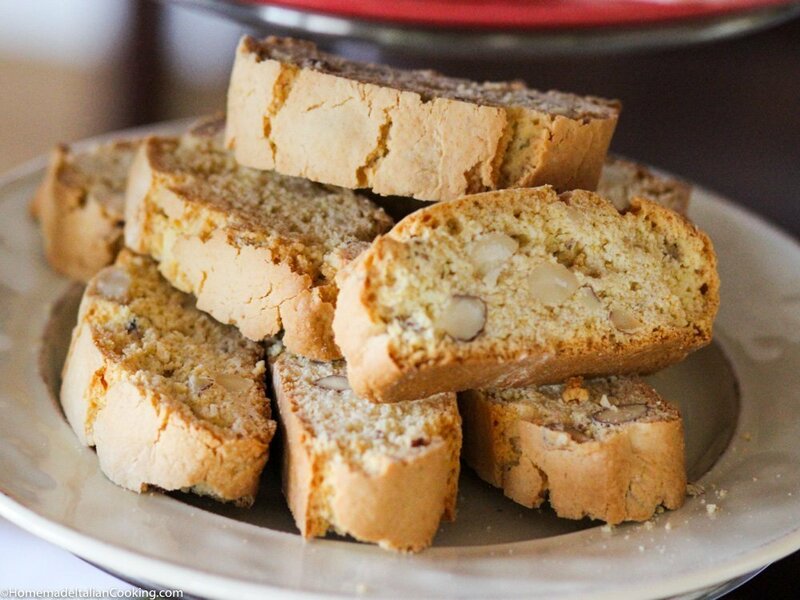 Homemade Classic Italian Biscotti are buttery, crumbly, and loaded with flavor. They are also very easy and forgiving to make. The recipe calls for a twice-baked process. The first time it is baked in a loaf shape. Then slice the loaf and bake the slices again until slightly crunchy and golden. They will keep for weeks in an airtight container. In a medium bowl, sift flour, salt and baking powder together. Add cornmeal and mix. Set aside. Place butter in large bowl of an electric mixer, whisk at medium speed adding 1 cup sugar until creamy. Add extracts and mix until fluffy and creamy. Add whole almonds and pecans to the wet mixture in the electric mixer bowl, and stir until combined. Place logs on a baking sheet covered with parchment paper or a silicon mat; gently flatten each log with the palm of your hand, and form even shaped loaves. 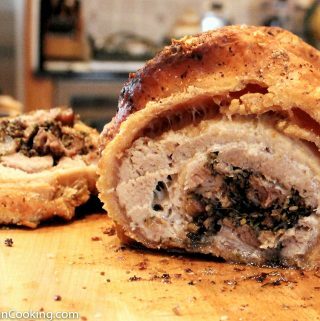 Bake at 350 degrees for 30 minutes or until slightly hardened and golden brown. Remove from oven and let cool on baking sheet for 30 minutes. Turn oven down to 325 degrees. Once cooled, place loaves on cutting board and carefully cut with a serrated bread knife on a slight diagonal into 3/4 inch slices. Line biscotti, cut side up, on the cooled baking sheet covered with another piece of parchment paper or a silicon mat. Bake at 325 degrees for 7 minutes until light golden brown and they have achieved the level of crispiness you desire. 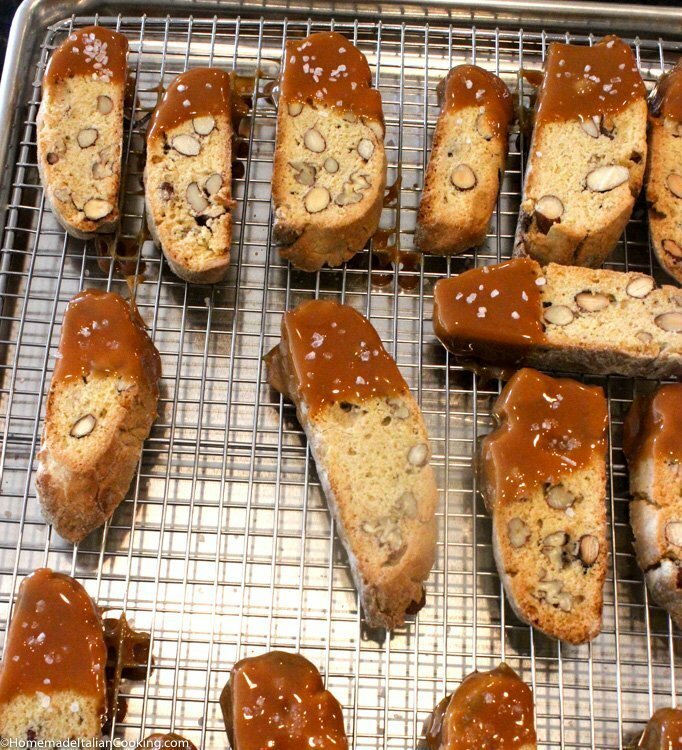 Remove biscotti to a wire rack and let cool.